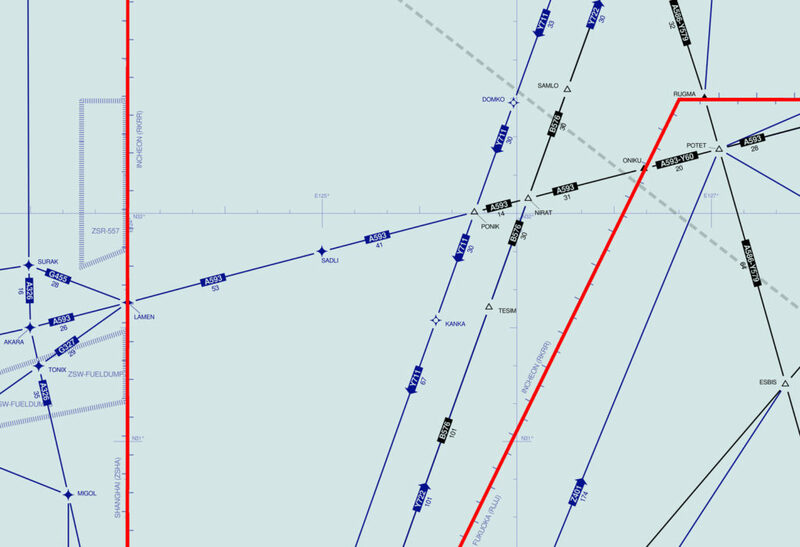 There’s a bit of airspace 100nm off the coast from ZSPD/Shanghai, known as the ‘AKARA Corridor’, where the different ACC’s (Shanghai, Incheon, and Fukuoka) are responsible for the control of aircraft at various different crossing points. This means that some crossing traffic is not on the same ATC frequency, nor controlled from the same area control centre. The ACC’s don’t talk to each other to coordinate flights through this bit of airspace, and this poses a big safety risk, especially in the case of emergency descents. In 1983, a Memorandum of Understanding was signed between China, Japan, Republic of Korea and ICAO for the management of air traffic in the southern part of the current Incheon FIR – this bit of airspace became known as the AKARA Corridor. This area is unusual in that more than one Area Control Center (ACC) is responsible for controlling aircraft at different waypoints. “Instead of responsibility for the control of ALL aircraft operating at the crossing point of air routes A593 and B576/Y722 (waypoint NIRAT) and Y711 (waypoint PONIK) being vested in a single air traffic control unit, it is vested under both the Incheon ACC and the Fukuoka ACC. Aircraft operating East/West on A593 are controlled by Fukuoka ACC (crossing Y711 at position PONIK and B576/Y722 at position NIRAT). Aircraft operating North/South on B576 and Y711 are under the control of Incheon ACC. Therefore, crossing traffic is not on the same ATC frequency, nor controlled from the same area control center. Following the implementation of RVSM in the INCHEON FIR in 2005, the allocation of flight levels on B576/Y711 was increased from 6 to 8 flight levels. Coincident with implementation of RVSM in China, levels available on A593 were also increased to include Flight Levels 300 and 310, while FL410 was replaced by FL400. It is understood that annually there are approximately 169000 movements on B576/Y711 and Y722, and 122,000 movements on A593; a dramatic increase over the insignificant traffic numbers of the mid-1980’s when the MOU was signed. Given the above, a very significant concern for operators is an unexpected contingency situation necessitating an emergency descent. ICAO provisions require that ATC will issue immediate traffic information and/or instructions to safeguard aircraft concerned. This is not possible when a controller does not have radio contact with, or control over, all of the aircraft operating in the affected airspace underneath. Obviously, this would not be an issue if the control of all the traffic at the crossing points of A593 with B576/Y722 and Y711 was vested in a single air traffic control unit, as is normally the case. g) inconsistent use of Strategic Lateral Offset Procedure (SLOP). Based on the above, The Fifth Meeting of the Asia Pacific Air Navigation Planning and Implementation Regional Group (APANPIRG) Air Traffic Management Sub-Group (ATM/SG/5, Bangkok, 31 July-04 August 2017) noted that China, ROK, Japan and ICAO should endeavor to normalize ICAO standard compliance within the AKARA Corridor.